Home eBook Marketing Review Contact Us Bookmark us! EBook Master Resell Rights and Software Packages With Turnkey Website Templates Make It Easy to Start Your Own EBook Business On The Internet! You can start your own internet ebook business quickly and easily with master resell rights to ebooks and software programs! All of our eBook packages and software packages include master resell rights, as well as turnkey website templates, resell rights salespages, ready to be customized with your own payment links! You can resell ebook and software products individually, or resell the entire ebook packages for 100% profits! Selling information products ("eBooks," "info-products" or "digital products") via instant download over the internet is one of the lowest start-up cost businesses you can start, with high profit potential. It is low overhead; you need no offices or retail space-- your website is your internet ebooks business 'storefront.' You don't have to pay to stock or ship products; all of your ebooks and software products are delivered electronically and instantaneously to your customers after payment. You don't need expensive merchant credit card accounts or special software or hardware to accept credit card payments over the internet. Inexpensive third-party processors like Clickbank handle your ebook and software credit card transactions for a small percentage, with no monthly minimums. Starting an internet software or ebook business is about the only remaining 'frontier' where you can start a business "on a shoestring" and turn it into a full-time, lucrative income. 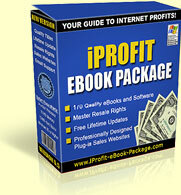 The iProfit EBook Business Package is one of the largest collections of profitable ebooks and software programs being sold online. 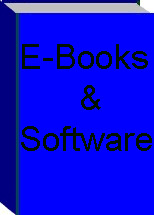 Each of the 180 ebooks and software products with Master Resell Rights in this package are internet bestsellers that are selling hundreds or thousands of downloads. The ebooks included are authored by the operators of many of the most successful internet ebook businesses, and reveal many of the secrets and methods they have used to make very large incomes. All of the ebooks and software programs include master resell rights, which means that you may resell them yourself, keeping all of the profits, and you may offer the same master resell rights to your customers. Each product includes a ready-made sales website, meaning you only have to include your own payment link to begin making sales. You may also resell the entire iProfit EBook Business Package, and the package includes a professionally-designed reseller website. The resellers website files even include a "sales page generator," so you can set it up with your Email address and payment link without even having to know how to edit HTML coding! This is the perfect turnkey website ebook business package for those new to website design and internet marketing. 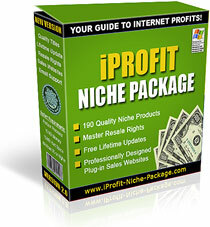 The iProfit Niche Marketing EBook Package The majority of people who are trying to earn money on the internet tend to sell only internet marketing type products. However, huge profits are being earned with products unrelated to internet business, so-called "niche market" products. Subjects like diets, recipes, crafts, weight loss, sports, gardening and online dating are among the most lucrative products sold online... and alot of these markets have much fewer competitors. Searching for these types of ebook master resell rights products used to be much more difficult, but the iProfit Niche Marketing EBook Package has certainly changed that. This package now includes 190 niche ebook products which all include master resell rights and professionally-designed sales websites. You also get master resell rights to the entire package, and turnkey website files. Like the EBook Business Package, the files for the Niche eBook Package include a sales page generator, and six months of free website hosting, making it easy for novices to get this site online and making money. PLR - Private Label Rights lets you change the content inside an ebook product any way you like. With plr - private label rights, you can add your own byline to the product as author, make any changes or do any rewriting that you like. PLR private lable rights ebooks are handy for website promotion and affiliate advertising because you can add any advertisements that you like to them, and promote your own websites and offers. You can sell them, give them away with your ads inside, whatever you want to do- there are NO restrictions! Check out our Viral Unlimited PLR - Private Label Rights Package including 17 hot PLR products you can resell. EBook Software and PDF Creator to Compile Your Own eBooks! PDF is quickly becoming the preferred format for ebook publishing. PDF ebooks can be read on almost every computer in the world. Now, with the eWriter PRO eBook Software you can begin publishing PDF ebooks including text, images, links, etc., in just minutes. The PDF ebooks you create will be just as professional and secure as those created using much more expensive software. It is estimated that the majority of web-based sales occur after seven contacts with a prospective customer. Therefore it is essential to the success of your internet business that you have a prospect follow-up system in place to allow for additional Email contacts with your website visitors, through an ezine/newsletter or autoresponder follow-up messages. 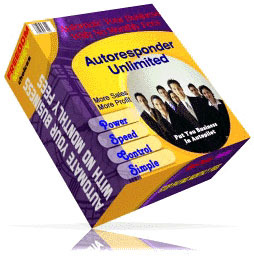 Autoresponder Unlimited! Why pay up to $20 a month for ONE 'smart' Email autoresponder when you can have unlimited autoresponders on your own domain, and pay no monthly fees? Our Pro Autoresponder script is simple to install on your own domain, and allows you to create an unlimited number of email autoresponders with form subscription and unlimited messages! We have used this Email autoresponder script ourselves to power several autoresponders. Purchase of the program includes master resell rights and turnkey website resell rights website, as well as pre-written autoresponder message series you may customize to sell your products, and ebooks on opt-in Email autoresponder marketing. We respect your privacy. Your E-mail address will not be traded, sold, rented, loaned or given to anyone, and you may unsubscribe at any time. Home eBook Marketing Review blog Contact Us Bookmark us!